Independent Banker magazine, the award-winning monthly publication of the Independent Community Bankers of America, is pleased to announce Busey Bank, Bank of Ann Arbor and Seacoast Bank as the three Social Media Leaders of 2016. 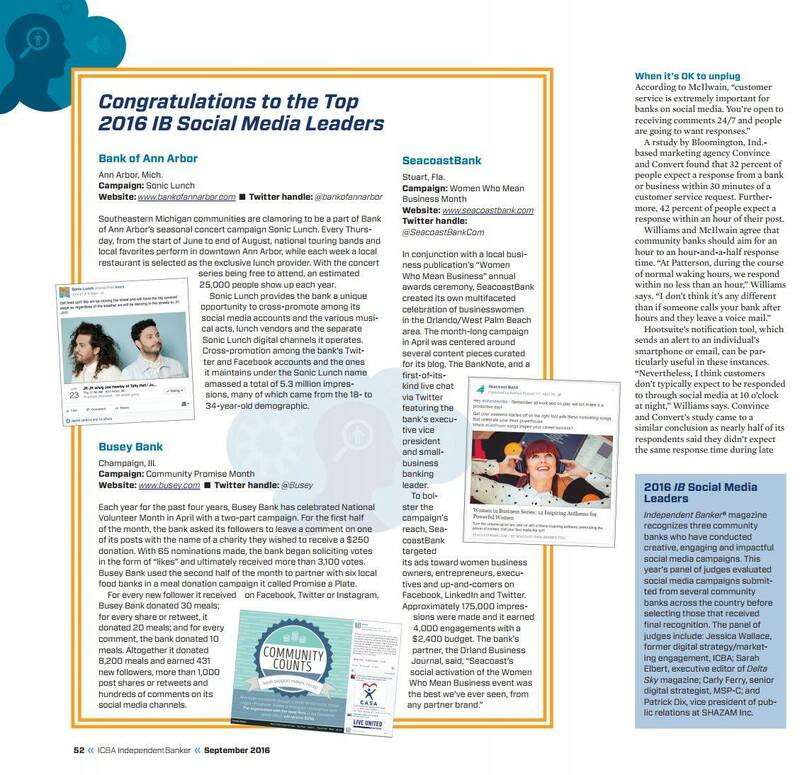 IB magazine recognizes community banks that effectively utilize social media to further their messaging, cross-sell, promote bank events or special services. This year’s panel of judges evaluated social media campaigns of more than 40 community banks, and the honor recognizes the three community banks that conducted creative, engaging and impactful social media campaigns. This is the fourth year the magazine has held this contest, with SHAZAM as this year’s sponsor. Profiles of the three winners will be highlighted in the September 2016 issue of Independent Banker magazine. Check them out here. Independent Banker is the award-winning monthly publication of the Independent Community Bankers of America—the number one source ICBA members rely on for community banking news. IB covers the news topics and trends that are important to the nation’s community bank senior executives. The magazine’s mission is twofold: to keep members informed about and connected with their national association and its activities; and provide members with timely, relevant information on developments to growth their business franchise within the rapidly evolving financial services industry. For more information, visit http://independentbanker.org.